REVOLVE teams up with Instagram favorite Likely on a bridesmaid capsule collection. The collaboration features dreamy dresses and gowns perfect for weddings or special occasions. The range includes pastel shades of pink and purple as well as white and black. Off-the-shoulder silhouettes with ruffle and lace details make for perfectly romantic styles. See more from the Likely bridesmaid dress collaboration below, and shop the full line at REVOLVE.com. This elegant off-the-shoulder dress features elastic lace sleeves with side seam slits. Made with flutter sleeves, a pastel dress includes a ruffled hem with a waist tie detail. Make a dramatic entrance with a ruffle embellished dress featuring a side slit. With a halter neckline, this gown comes in a powder pink hue with a waist tie detail. 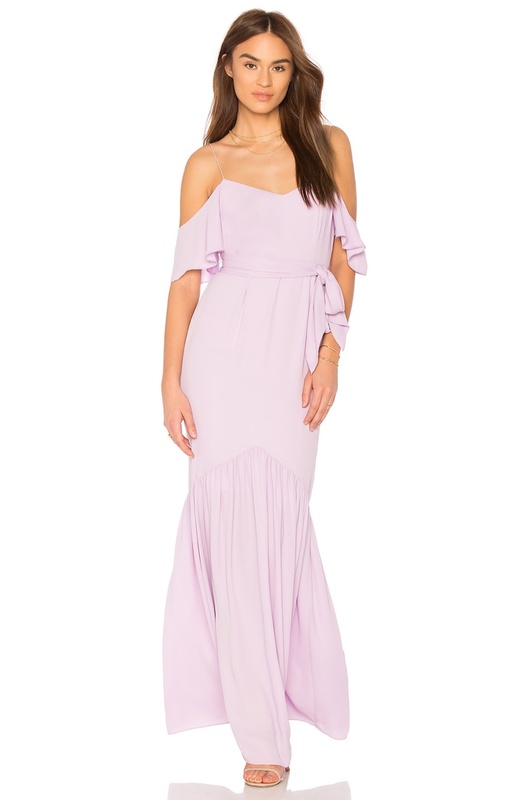 Flaunt some shoulder in a lilac gown made with a zipper closure. Channel vixen vibes in a black dress featuring dramatic ruffles as well as a slide slit.